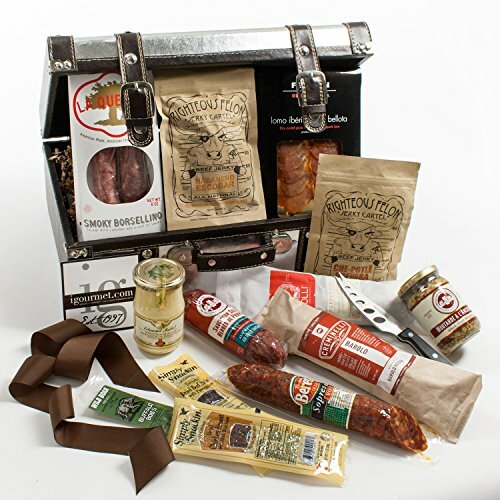 The Gourmet Gift Case Includes Lomo Iberico de Bellota by Fermin Sausage (2 oz), Salami Barolo by Creminelli (7 oz), Pepperoni by Olli Salumeria (6 oz), Righteous Felon Jerky (2 x 2oz = 4 oz), Saucisson Sec Aux Herbes de Provence (8 oz), Sopressata by Beretta (9 oz), Borsellino Salami by La Quercia (6 oz), Buffalo Bobs Jerky (.75 oz), Silver Creek Jerky (2 x 1 oz = 2 oz), French Mustard by Les Trois Petits Cochons (7.1 oz), Edmond Fallot Dijon Mustard with Burgundy Wine (7 oz), and Cheese Serving Knife The KaBloom Gift Basket Collection consists of a variety of gourmet gift baskets including cheese gift baskets, chocolate gift baskets, charcuterie gift baskets and More! Includes: Lomo Iberico de Bellota Sausage, Salami Barolo, Righteous Felon Jerky, Saucisson Sec Aux Herbes de Provence Sausage, Sopressata by Beretta Pork Salami, Borsellino Salami, and More! Makes the perfect gift for Birthdays, Anniversaries, Easter, Mother's Day & More! Please see the product description below for full details of the yummie foods included in the gift basket! If you have any questions about this product by KaBloom, contact us by completing and submitting the form below. If you are looking for a specif part number, please include it with your message.